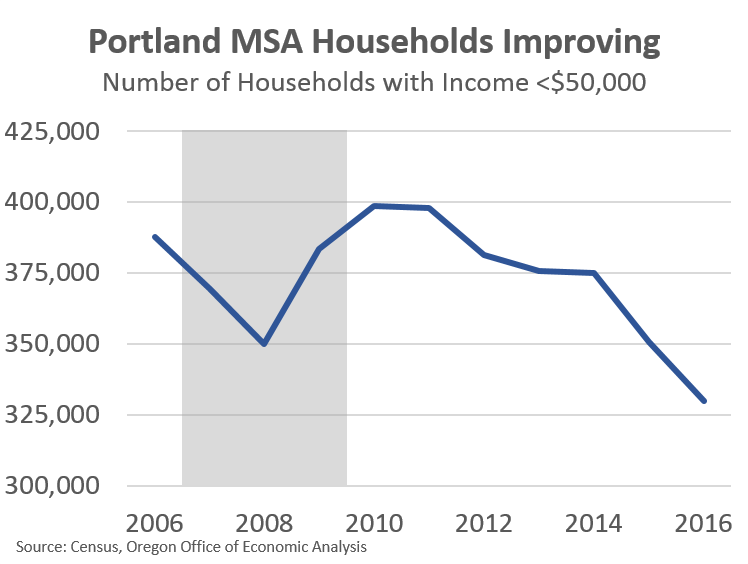 Over the past decade the number of lower-income households in the Portland region has fallen by nearly 60,000, or by 15%. Here, we’re defining lower-income to not just be those in poverty, but generally speaking in the bottom 40% or so of the distribution. Conversely, the vast majority of household growth this cycle is among those making $100,000 or more. To the extent that these changes reflect a stronger economy in which household incomes are rising, then this is great news. However, we also know that lower-income households and those on fixed income bear the brunt of the housing affordability crunch. The concern for current residents and for future growth is that some of this drop in lower-income households may be due to folks packing up and leaving the region entirely. As our office regularly discusses, the concern is that affordability may eventually slow or even choke off migration entirely. That outcome would be terrible for local residents as housing costs rise, it would lead to greater displacement as only higher-income households could afford to move here, and it would potentially lower medium and longer-run economic growth*. These concerns are not just theoretical. We know that lower-income households are moving out of California in greater numbers, and work from BuildZoom’s Issi Romem shows that nationally we are experiencing a sorting across metro areas based on income, educational attainment, and the like. So what about the Portland region? Here, thankfully, we are not seeing net out-migration among lower-income households. In every year in the past decade more lower-income households have moved into the Portland region than have moved out of the Portland region. Additionally, the gross flows do not seem to be slowing much either. That is the affordability issues do not seem to be deterring folks from moving here in the first place. Furthermore, when we look around at the reasons why people move away, there doesn’t appear to be much of an increase in those citing housing as the reason. We have to switch to state level data due to availability and sample size issues. 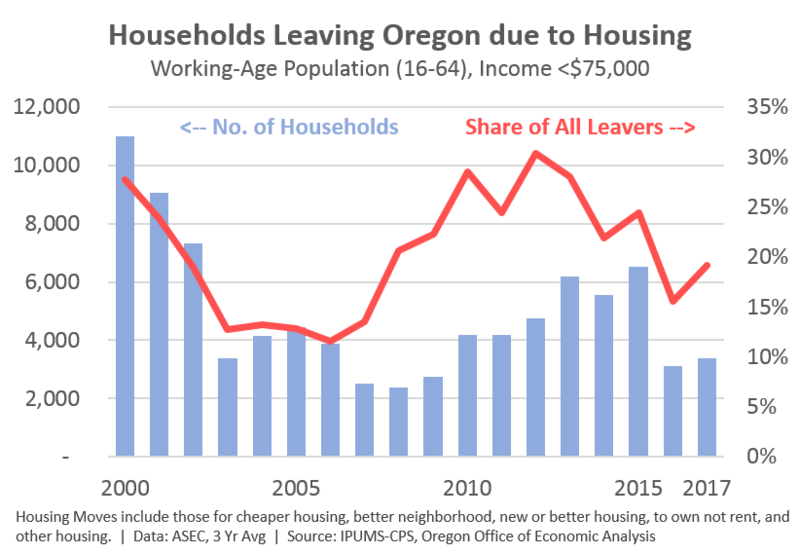 However, even as there was an uptick in housing-related moves a few years ago, those have slowed lately and always remained a minority of the reasons people left Oregon overall. Combined, at least in the data we have available to work with, it does not appear that housing and housing affordability in particular are driving households away from the Portland region, or Oregon more broadly. Overall that is very good news from a societal and an economic (labor force) standpoint. Now, that is not the same thing as saying there is no impact. We know that there is. Displacement is certainly occurring within the Portland region. Lower-income households have been and continue to be pushed toward the edges of the metro region, into east Multnomah County in particular. This is part of the increasing geographic disparities seen across the state. While the added housing supply in the urban core is now holding down rents and raising vacancy rates, this is not yet the case in East Portland, or in Troutdale/Fairview/Wood Village/Gresham based on the latest Multifamily NW apartment report. While these areas have some of the lowest rents in the region, they also have the lowest vacancy rates today. OK, so if out-migration does not explain the declines seen among lower-income households, what does? I originally had a much larger research project focused just on this question but have shelved that. The end results, via a process of elimination shows that the decline is due to higher household incomes, likely the result of a stronger economy. That may seem a bit tautological, and to certain degree it is. There are lots of puts and takes when it comes to households, household incomes, household formation and the like. However, in controlling for a lot of these known factors — migration trends, inflation, demographics, headship rates — I found that they largely offset overall. For example, we know headship rates are falling so that would indicate we should have relatively fewer households. However we have more 20- and 30-somethings today meaning we should have relatively more lower-income households as young professionals typically earn less money than more experienced workers. But these two factors are of approximately the same magnitude, but in different directions, thus offsetting each other. Furthermore young adults doubling and tripling up in apartments as opposed to living on their own is not a large enough factor here to explain these differences either. So the end result I am left with is that household incomes are rising as more people have a job and wages increase as well. We obviously know this is happening, but it is also useful to know that these other influences on households are not a significant driver of the overall trends in recent years. Bottom Line: The housing affordability crunch has caused issues within the Portland region, and across Oregon. Lower-income households are less able to afford the higher rents today. And even as affordability is set to improve in the coming years as incomes rise and rents slow, housing costs are a significantly higher share of household budgets than 5, 10, or 20 years ago. The one silver lining here, from a regional economic perspective, is that households are not packing up and leaving the region entirely. That said, being pushed to the edges of the metro area causes other problems in terms of commutes, transit access and the like. * Would worsening affordability actually lead to lower growth in the future? This was the topic of conversation among our advisors recently and it’s hard to tell. Theoretically it makes sense. However if you look at California, and the Bay Area, it is difficult to say their growth is suffering. Job growth in California has matched Oregon’s, as has San Francisco’s matched Portland’s. Now, the counterfactual is very likely that California and the Bay Area would be growing faster than they are if not for the affordability problems and lack of supply. This means an alternative to slower growth, would be increased displacement. This has occurred in the Bay Area, where lower- and moderate-income households are pushed out and experience longer commutes and the like. As such it is reasonable to think that could occur in the Portland region as well. Overall economic growth may not be that much slower due to a worsening affordability and supply problem, but distribution of that growth and consequences for lower- and moderate-income households certainly would be worse. Thanks for another great post, Josh. A couple of thoughts on that top graph. If you are using ACS data for household income, because the question asked in the survey pertains to income over “the previous 12 months”, perhaps you should shift that line to the left about a year, in which case the sharp rise in lower-income households would line up better with the onset of recession. The other thought is whether these household incomes have been adjusted for cost of living. With inflation, the number of households falling below any static threshold would be expected to decline over time, even if all they are doing is keeping up, right? Thanks Bill. Yes the date issue is a potential concern. Complicating factor is the ACS is a continuous sample, so the 2008 data is a compilation of folks answering questions in January 2008 and in December 2008. Each answers how much income earned in past 12 months. Census does inflation-adjustments for the within year differences to get an annual figure. But, yeah, not perfect. As for inflation, absolutely that is at play. And if we look at real incomes, we don’t see as big of a drop as the nominal chart shows because someone going from $40,000 a decade ago to $51,000 today has seen essentially no real increase but they have moved out of the under $50,000 bracket. So that’s why I controlled for inflation when decomposing these shifts, and why I only looked at migration trends based on real income not nominal. For the decomposition, to put the inflation part in perspective it is about the same size as migration, but in the opposite direction. 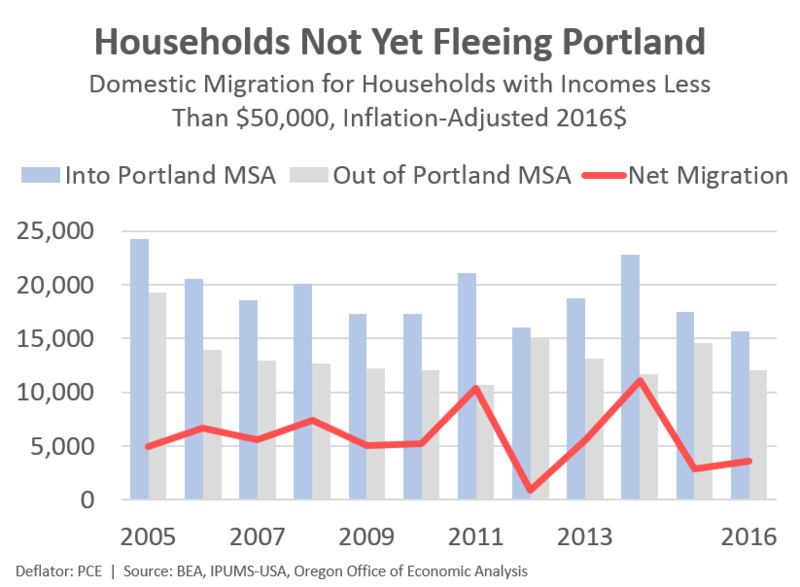 Basically, net migration added 50-60,000 lower-income household in the Portland region in the past decade, while inflation removed about 50-60,000 households from the under $50,000 bracket. That’s part of the offsetting nature of some of these known factors I looked at.